This week the beautiful Brenda from Mira Narnie is sharing with us a gorgeously simple and very versatile gift for a girl of any age! Brenda is a beautiful, stylish & talented soul and was one of the very first blogs that I started following. I have always felt a kindred spirit and I am very lucky to have actually met her IRL* on a number of occasions. I’d highly recommend heading over to her neck of the woods. Thanks Brenda! I love handmade gifts for girls. I love making them, and I love when my little girl receives them. So when Emma invited me to contribute to this segment, I was a little chuffed, but just delighted to have an excuse to make something oh so girly. 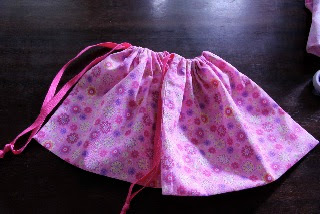 This project is a simple one, so great if you are a beginner and if your sewing skills are more advanced, don’t dismiss the humble draw string bag, as it’s a great way to stash other goodies that you make your recipient. So this is what you will need. 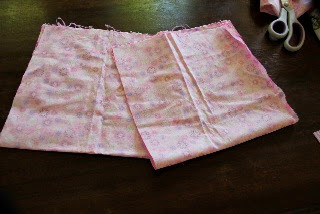 Cut your fabric to your desired length. 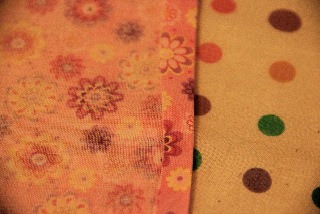 Fold in half with right sides together. Sew down one side from top to bottom. 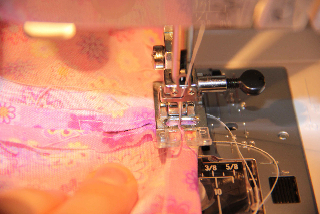 Sew on the other side, but leave a one inch gap about one inch down (as this will form the casing for the ribbon to go through later). Iron the seams of that gap so that they are lying flat. 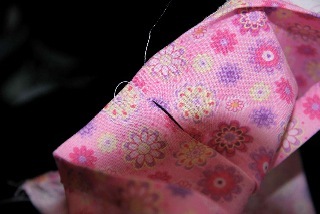 Now, top stitch all around that gap, so as to neaten the edge. Turn down the opening of the bag about 1cm and press. Then turn down again hiding the raw edge, ensuring that your casing opening is at the top edge. Press this again. 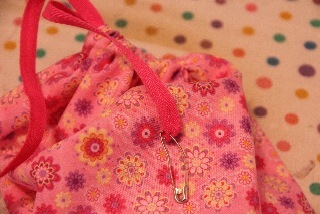 Pin to secure and sew all around your bag making sure you don’t sew that little opening. 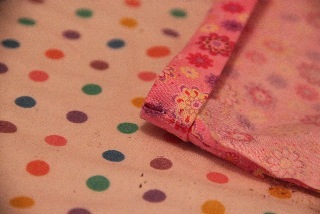 Take your ribbon of choice and attach the saftey pin. 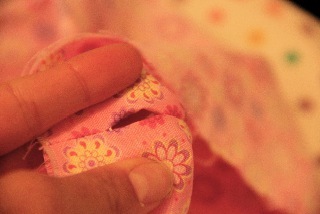 Use the saftey pin to help you guide the ribbon through the casing. Join the two ends of the ribbon and tie a knot to prevent it slipping back through and so your lovely little bag can adorn a little girls wrist. Give it all another press and your done! Fill it with other handmade delights and give to a gorgeous girl you know. I made two at once. 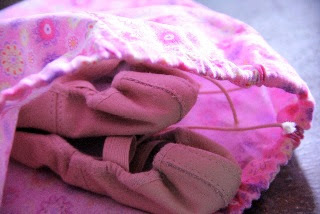 One is for my daughter ballet slippers and the other bag will be a birthday gift. * IRL – “In Real Life”. Great tute – love this one Emma… and thanks Brenda! that would be *one* of my packs!